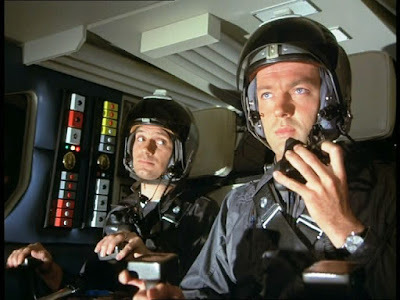 John Kenneth Muir's Reflections on Cult Movies and Classic TV: UFO: "Exposed"
In "Exposed," a speeding UFO skirts past interceptor missiles in near space, and is seen in orbit by a hot-shot test pilot, Paul Foster (Michael Billington). After recovering from a six day coma, Foster learns that his experimental plane, the XV-104, was destroyed and his co-pilot killed. Foster also learns that his employers at Ventura Aircrafts blames him and "pilot error" for the disaster. Furthermore, photos recovered from the plane show no signs of an alien craft in Earth orbit. Paul's record also speaks against his veracity. He has reported seeing UFOs three times during an eight year span. 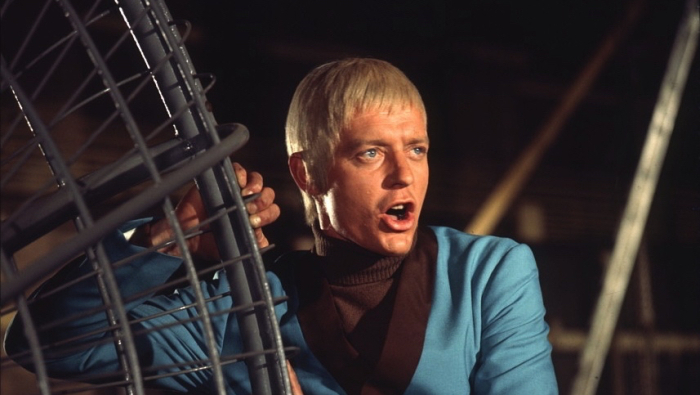 Desperate to clear his name and standing, Paul begins a personal investigation of the disaster, an investigation that leads him to a man named Ed Straker, and the secrets of SHADO. Gerry and Sylvia Anderson's UFO gets a second (or is it third?) male lead in "Exposed," an episode that introduces the character of test pilot Paul Foster. If Straker functions as the brains and determination of SHADO, Foster surely represents the youth, vigor, physicality, and sexuality. That may be an over-statement in some sense, however, because Foster proves in this episode that he is every bit as stubborn and resourceful as SHADO's commanding officer. 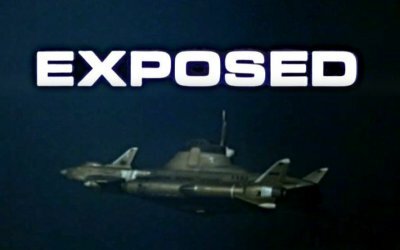 "Exposed" is fascinating in terms of UFO episode content because at the same time that it keeps tabs on the wily, in-the-know Straker, it reveals an outsider's experience of SHADO.Basically, the organization organizes a vast, complex conspiracy to prevent anyone from knowing the truth about what happened to Foster's co-pilot, and plane. Evidence is tampered with, a cover-up is engineered, and a spy (Jean Marsh) is even put in close contact with Paul, to prevent the truth from being discovered. 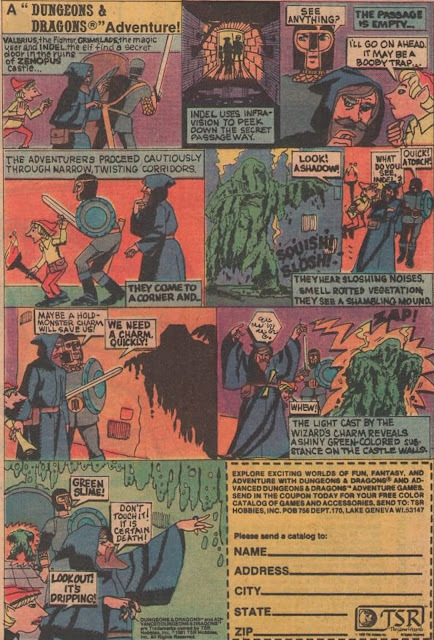 In fact, SHADO also arranges for Paul to experience "temporary blindness" for a spell as Straker and others decide how to handle him and his knowledge. From an outside perspective, none of this is very nice, or even legal. Today, "Exposed" plays like a twisted version of a mytharc X-Files story. In The X-Files, Mulder and Scully often try to uncover pilot or bystander stories regarding UFOs, but are stymied at every turn by the shadowy conspiracy and the Cigarette Smoking Man. In UFO, the people of the shadowy conspiracy are basically the protagonists, and the truth must remain buried, except for a chosen few. The two series, in some way, thus represent looking-glass reflections of one another. While Mulder is a champion of freedom, both or people and of information, Straker makes it plain during "Exposed" that allowing the world's population to know the truth about the aliens is not an option because it would cause "a breakdown of authority," not to mention "mass hysteria" and "panic." Unspoken in the series is a faith in the government and its many organs, a faith that, post-Watergate, would simply have not existed. Intriguingly, Paul absolutely buys into the SHADO (paranoid?) view-point once he is told that everything has merely been a test to judge if he is worthy of joining the organization. In other words, Foster is not okay with the truth being hidden from him, but once he's on the inside, he's okay with the truth being hidden from others. This hypocrisy doesn't reveal him in the best light. "Exposed" is fascinating, because it operates on the series' standard "double" thematic track. In many UFO episodes, Straker makes it plain that the aliens must be defeated at any cost, and the alien weekly schemes are, indeed, usually stopped in their tracks. These instances are clearly victories for SHADO. And yet, there is always, at the same time, a "human cost" for these victories. Consider "Identified:" SHADO captures an alien pilot and learns much about his physiology and nature. At the same time, however, the human cost hits Carlin's family hard: the discovery that his sister's organs have been harvested by the aliens. An upcoming episode, "A Question of Priorities," goes even further down this road, revealing the human cost to Straker when there is an attempt to capture an alien defector. In "Exposed," the human cost is Foster's career, reputation, and credibility. Straker is willing to see Foster destroyed if he doesn't pass SHADO's test. He has no compunctions about ruining a man's life if it keeps the secret of SHADO. As these instances reveal, UFO is a hard-edged series, even by today's standards, with no real happy endings. Sure, Paul gets a new career in "Exposed," but a pilot has died, an aircraft is destroyed, and the world's people remain in the dark about "the truth." The last question raised by "Exposed" involves the necessity of a character like Paul Foster in the series' mix. He's a charismatic, conventionally-handsome, romantic lead. Foster takes center stage in a way that Carlin, or Alec, can't. Alec comes across as a bit of a lech in "Identified," and Carlin is a bit charisma-deficient.So perhaps Straker needs a second in command who captures this demographic. Yet as I wrote last week, Straker remains the series' most compelling individual. 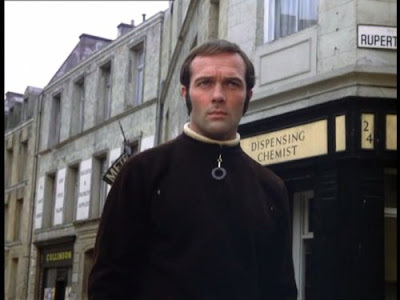 He possesses a depth that many of the secondary characters simply lack This episode may ostensibly involve Foster's dogged hunt to solve an impenetrable mystery, but when the resolution is offered, the audience realizes that Straker has been pulling the strings all along. He is a master manipulator. Next week: "A Question of Priorities."